The new model predicts the glow of black holes before their collision. 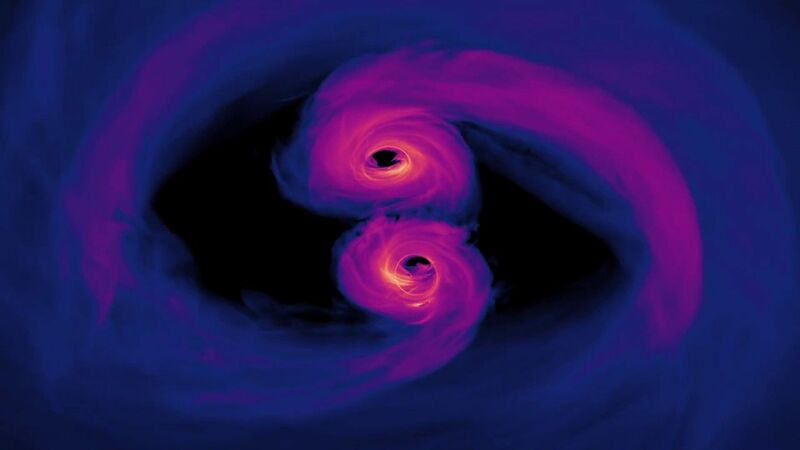 According to the new model, the fusion of supermassive black holes is accompanied by an unusual ultraviolet and X-ray emission, while they rotate around each other until the collision itself. Supermassive black holes are millions and billions of times more massive than the sun. Scientists believe that they are in the center of every large galaxy. It is known that galaxies often collide – this is exactly what will happen with the Milky Way and Andromeda in about four billion years. Although the fusion of black holes has already been observed using the LIGO experiment, the fusion of supermassive black holes is much more difficult to track, since they are located further away and emit very weak signals of gravitational waves. To register such a small signal, the sensors must be in space to get rid of any seismic noise produced by our planet. Such a sensor – Laser Interferometer Space Antenna, or LISA – in the 2030s will launch the European Space Agency (ESA) into space. There is another possible way to detect the confluence of supermassive black holes. When merging galaxies should be considered clusters of gas and dust, stars and planets. Most of this material will attract black holes, which then begin to absorb it, generating radiation, which astronomers can observe until the material crosses the event horizon. Researchers have developed a simulation, with the help of which they traced what is happening in three orbits of supermassive black holes, located approximately 40 orbits from complete merging. The model assumes that at this stage of the fusion using telescopes it will be possible to observe ultraviolet and high-energy X-rays. The work is described in an article in the journal Astrophysical Journal. The simulation suggests that the x-rays in the fusion of supermassive black holes will be brighter and more diverse than that observed in single supermassive black holes. The simulation was carried out on the Blue Waters supercomputer at the National Center for Supercomputer Applications at the University of Illinois at Urbana-Champaign.